If you haven’t experienced the thrill of Myrtle Beach Jet skiing, you are really missing out. A jet skiing adventure on Myrtle Beach is one of those experiences I wouldn’t trade for the world. Whether you are a beginner or a seasoned jet skiing pro, the Action Water Sportz always has you covered. Their standards are consistently high and every other time feels like a new experience. It’s always good to be sure that there is a jet ski waiting for you before embarking on your vacation. This is the best way to avoid all the troubles that come with a last-minute rush. Run through all the available options and find the perfect fit for you and yours. Different rental shops have different prices. Each shop will also include different components in each package. Morning rates are generally lower compared to afternoon rates in most places. You might also want to check if the quoted price includes life jackets, gas, and insurance. At Action Water Sportz everything is included in the price, including a certified guide to ensure your safety. Every rental agreement has to include certain items in the package. 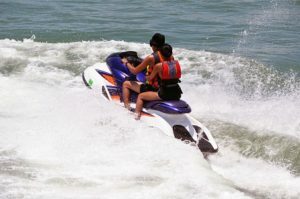 These include an on-water demonstration and pre-rental instructions on how to operate the jet ski. It is also important for safety instructions to be displayed properly on the jet ski. Jet ski rental agreements usually have time stipulations. In many cases, you will be charged for the extra hours if you are late in returning the jet ski, depending on the stipulations of your agreement. At the same time, it is not safe to operate a jet ski 30 minutes after sunset or 30 minutes before sunrise as you may not be visible to boaters. A proper life jacket is very important when jet skiing. In fact, it is a requirement in most rental locations, including Myrtle Beach. Jet skis also have a cutoff switch lanyard that riders should attach to their clothing or life jackets. This helps shut off the jet ski’s engine in case one falls off while riding. It’s always good to arrive at the rentals early. For rookies, this is the best time to watch a brief safety demonstration before hitting the waters. It is also the time to take a look at all the rules and regulations. These include speed limits and no-wake zones among others. If you have enough jet skiing experience and feel like being a little more adventurous, you may want to use a stand-up jet ski if there is any available. A stand-up jet ski is good for performing extra tricks maneuvering faster in the water. Don’t jump in the wakes or path of passing boats. Don’t capsize the jet ski as this might cause flooding of the engine. Don’t ski too close to other watercraft. Don’t over speed as may lead to accidents and mishaps. It is not too early to reserve your Myrtle Beach Jet Ski for the 2019 summer vacation season.